Today we are featuring some of our more exotic West African dishes and will be hearing from an expert in 'World' or 'Fusuion' Cuisine. Khamisa Dike is the proprietor of The Suya Grill, an Atlanta based catering comapany specializing in Event Planning and Chef Services. Their signature dish is Suya, a West African style spicy kebob. Ask any Nigerian, Senegalese or Ghanian about Suya and they start to salivate as they think of those spicy kebabs cooked over open coals in their native land. Khamisa: The Suya- Grill is more than a catering service, it is a unique culinary experience! We offer a vast array of mouth-watering snacks and appetizing meals created from the most delectable African, Asian and world fusion recipes. The foods are not only delicious but also versatile! These are meals to accommodate even the most discriminating taste bud. Unique in their origin, but cross-cultural in their appeal, the Suya-Grill menu is limited only by your imagination. Khamisa: Suya-Grill offers an array of tantalizing hors d’oeuvres with universal appeal, hot delicious meals and menu choices to fit any party needs. Our meals are masterfully created with a combination of well-integrated exotic spices and seasonings. The products are made fresh and from scratch. We neither compromise nor substitute our spices and seasonings. This is why our meals have proven authenticity. Try them all or create your own menu from our extensive choices! 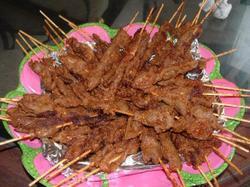 Khamisa: Suya-Grill is multifaceted to accommodate the various needs of our clients. Our services include the creation of an excellent menu choice to meet specific and unique needs of every client. We also offer customized catering for small groups of two to thirty. Dinner for Two - Our popular “Dinner for Two” service offers a romantic option for couples who wish to have the same great service and good food offered in fine restaurants, without leaving the comfort of their home. The Soireé - This plan caters to the needs of small group meetings, get-togethers, parties of between 10 and 30 guests. The Coporate Plan – The Suya-Grill corporate plan is proud to introduce “Nations Day” to multicultural companies. Khamisa: A Cook Book – This cook book will show you how to cook African meals from the comfort of your home. We will explore some of the delectable selections featured in the Suya Grill Menu. Our website will be up and running by early 2008, it will offer recipes and ideas which can be purchased and downloaded online! I tried to email the Suya Grill from the above Suya blog, however the email was undeliverable, would you have another email address or website?